I’ve wanted to post a recipe for ajo blanco since my friend Félix Ortiz told me about it several weeks ago. Waiting out the garlic scapes and spring varieties in the farmer’s market, I finally tried it when the first full formed garlic appeared. Trying to incorporate the mashing with the blending with the right amount of water, I ended up with three consecutive batches of garlic milk. If you haven’t tried garlic milk, don’t. Consulting Anya Von Bremzen’s The New Spanish Table, I was able to figure out what went wrong. Without a mortar and pestle large enough to really work the oil into the bread and almond mixture, it didn’t emulsify the way it should, either too thin or too grainy. I switched over to the blender after making the initial paste and it gave me the right consistency in a few whirls. The final result was smooth, refreshing, and easy. 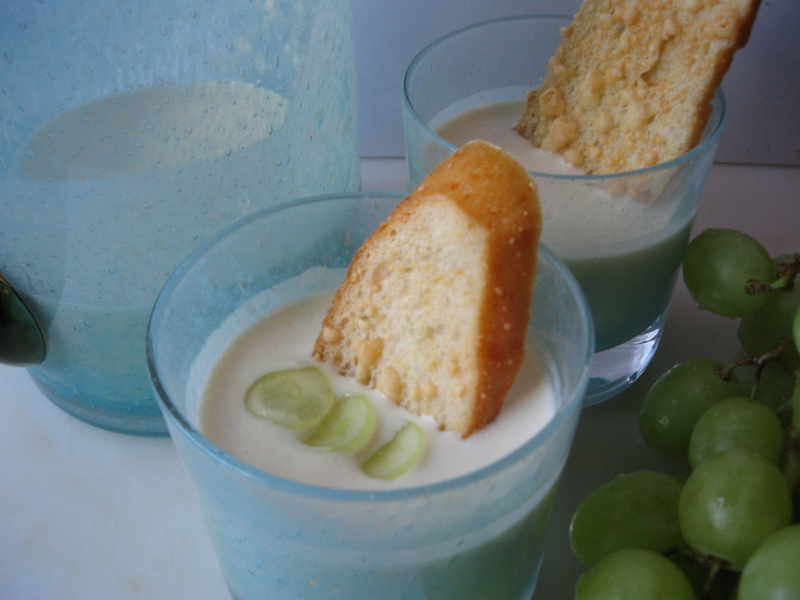 Typical of Málaga, this creamy white gazpacho makes a great light, mid-summer meal. This recipe is adapted from Anya von Bremzen’s The New Spanish Table. For the complete recipe, click here. I added green grapes, apples and figs can be substituted. Soak the bread in water to cover for 5-10 minutes. Drain and squeeze out excess liquid. Place the bread into a blender. In a pot of boiling water, blanch the almonds 1-2 minutes. Strain and peel. Finely chop or grind in a food processor. Using a mortar and pestle, mash the salt, garlic, and almonds to a fine paste. Add to blender. Puree paste and bread with 1 cup of cold water till smooth. With blender running at high speed, pour the olive oil in a steady stream until emulsified. Pour mixture into a bowl and mix in vinegar. Add remaining 1/2 cup of water till it has the consistency of thick cream or smoothie. Adjust vinegar and salt to taste. Chill for at least 2 hours. Add grapes and serve with fried bread or croutons.